Sad and hopeless for no reason, and these feelings do not go away? Very angry most of the time and crying a lot or overreacting to things? Unable to get over a loss or death of someone important? Extremely fearful or having unexplained fears? Constantly concerned about physical problems or physical appearance? Frightened that his or her mind either is controlled or is out of control? Showing declining performance in school? Losing interest in things once enjoyed? Experiencing unexplained changes in sleeping or eating patterns? Avoiding friends or family and wanting to be alone all the time? Daydreaming too much and not completing tasks? Feeling life is too hard to handle? Hearing voices that cannot be explained? Poor concentration and is unable to think straight or make up his or her mind? An inability to sit still or focus attention? Worry about being harmed, hurting others, or doing something "bad"? A need to wash, clean things, or perform certain routines many times every day, in order to avoid an unsubstantiated danger? Using alcohol or other drugs? Eating large amounts of food and then purging, or abusing laxatives, to avoid weight gain? Violating the rights of others or constantly breaking the law without regard for other people? Doing things that can be life threatening? Children and adolescents with mental health issues need to get help as soon as possible. This may involve working through a trauma, adjusting to changes in the family, adjusting to new challenges in their peer group or at school, or learning skills to face problems with which they don’t know how to cope. 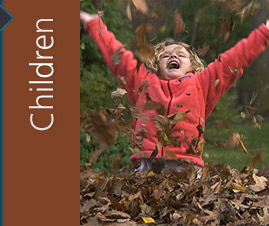 Child therapy is tailored to the developmental readiness of the child as well as the child’s individual temperament. Children process their feelings in their play. Play may be the primary language expressing a child's world. Just as adults have differing coping styles, children cope with life's challenges uniquely. A timely counseling intervention to aid a child's response to stressful or traumatic events helps in the immediate crisis and may transform the long-term effects. Children may express depression and anxiety through anger or acting out behaviors. The highly- sensitive child can thrive in the therapeutic setting as coping skills are developed to help his or her temperament to blossom.